Sometimes when life starts to rev up a little too fast my natural instinct is to retreat to my safe place. It has always worked well, but it inhibits continuous forward motion. So, over the years, I’ve learned to deal with it without retreating. I bake. And I bake something I love. Like these cookies. They are actually a variation of my cookie. 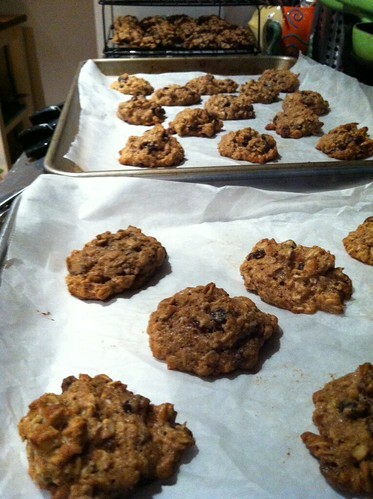 I say my cookie because it was these cookies that started this whole baking craze hobby of mine. However, I had an especially ripe banana laying pathetically on my counter top, so I figured I make a variation of my cookie and add a banana into it. In another bowl mix together: 1 cup all purpose flour + 1/2 cup whole wheat flour + 1 teaspoon cinnamon + 1 teaspoon baking soda + 1/2 teaspoon salt. Add flour mix into wet and mix until just combined. Take bowl out of mixer and add 3 cups plus a good couple of handfuls of Old Fashioned Oatmeal (not the instant kind) and 1-2 cups of raisins. Mix together with a spatula until it all comes together. Bake in a 350 degF oven for about 10 minutes, until about golden brownish (at this point you should be able to smell them). A trick I learned at a cooking class was the cookie is done when the bottoms have gone golden brown. 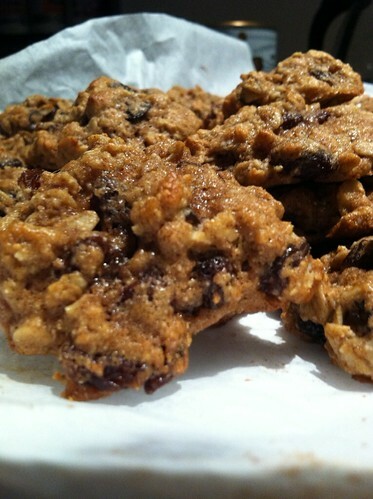 These cookies are very soft when hot, so take the tray out of the oven and use a flat spatula to lift the cookie up. When done, let sit on the pan for a couple of minutes then transfer to a cooling rack to cool all the way. What I love about them is that these cookies aren’t very sweet. 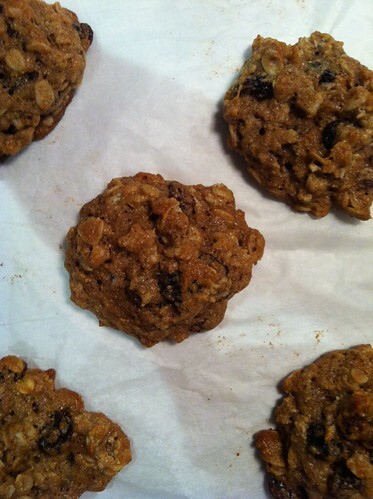 With the banana it almost feels like a breakfast cookie. So, I’m finally off to Scotland for my marathon on Wednesday! I promise I will have stories to entertain you with! It’s been a crazy month. Some doors are closing and others are opening. So much change, so many new adventures to be embarked on, new friends and new places. It gets a little overwhelming, but it’s all for the good, and I just have to keep remembering that. But, till then kids…I need a cookie…. 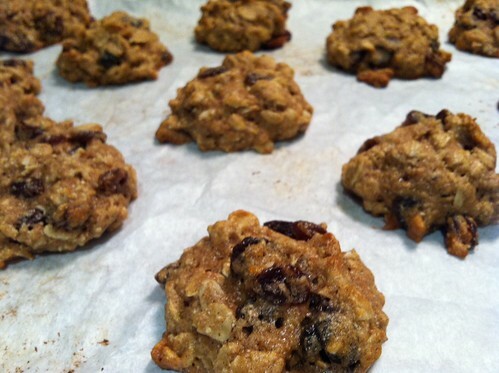 This entry was posted in Cookies, Uncategorized and tagged Banana, Cookie, Oatmeal, Raisin. Bookmark the permalink. Your cookies are the best!! Looking at them makes me drool….